This year’s Boston Marathon was nothing short of incredible: the awful conditions, the first American female to win in 33 years, and what many are calling a day for the blue-collar runner. This week’s Friday Thrive rounds up a few noteworthy articles of the deluge of media published this week about the historic race. For better or for worse, running has become hyper-professionalized lately. Last year witnessed the carefully orchestrated Breaking-2 attempt outside of an actual race. And then the Boston Marathon flipped everything upside down: runners with full-time day jobs and no sponsorships claimed spots on the podium. Martin Fitz Hubner writes for Outside, “It was as though the marathon gods summoned a mid-April tempest just to remind us that the event isn’t supposed to be about the sterile pursuit of arbitrary records.” Read the full article – “The 2018 Boston Marathon was Perfect Chaos” for a full discussion of all the perfect chaos of the race – including the “sartorial eccentricity” of the day, such as Galen Rupp’s wardrobe looking like a runner’s version of a bandit costume while winner Yui Kawauchi (who has raced in a panda suit before) wearing the typical marathoner gear in a cold downpour. At the start of the race, Ryan remarked how Desi has never won. She’s consistently been in second, third, or fourth – yet she never gave up and kept plugging away at her training. 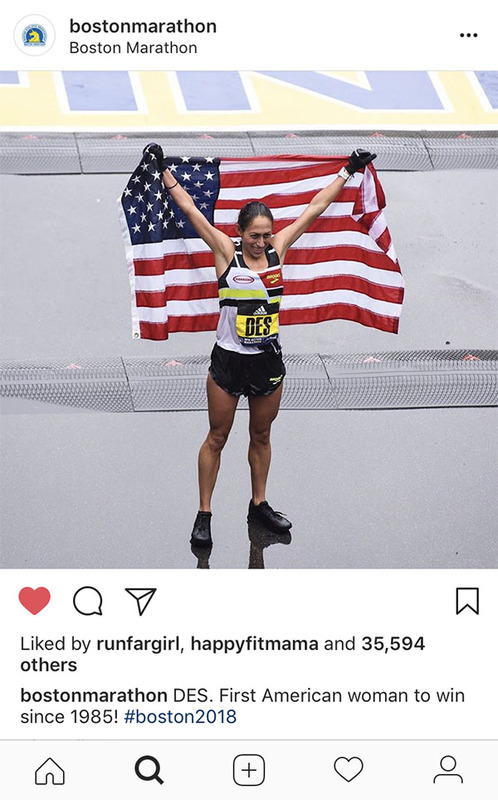 Desi debuted in the marathon back in 2007 with a 2:44 and worked her way down to a PR of 2:22, made two Olympic teams, and finally, earned a Boston Marathon victory in her sixth attempt. As Runner’s World phrases it in this article, Desi “is the patron saint of the pluggers, the people who show up, on time, every day, and keep putting in the work, and who don’t have any expectation that anything will be handed to them.” And no doubt her work ethic that kept her training throughout these years also propelled her through the brutalist conditions Boston has seen in over 30 years. According to the New York Times, when Sarah Sellers crossed the finish line on Monday, she asked the officials her place. They informed her she was second, to which she inquired in which division. When they told her overall, she was in shock. 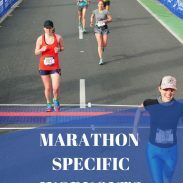 Sarah’s story is impressive: she set out to qualify for the Olympic Trial in her second marathon and balanced training with a full-time nursing job. Her story is a Cinderella story that unfolded somewhere between Hopkins and Boylston, as she started passing more and more people throughout the race. Read her full story here, “The Nurse Who Took a Very Different Route to 2nd Place in the Boston Marathon”. As I watched the Boston Marathon, we had similar weather in Seattle: 40-something degrees with wind and steady rain. At one point I wondered how bad it was on the course – my experience of running in the rain is that it’s never as awful as it seems and that the worst part is when you’ve finished and are still soaked but your body temperature is plummeting. But what about those winds? Or being out there for all 26.2 miles? 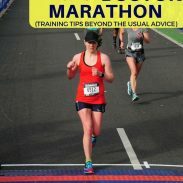 The Secret to Winning a Marathon Major? The Runner’s World piece “How Desi Linden is Busting Out of a Running Slump” is an older article – published in November 2017 – but it’s worth re-reading in light of Desi’s Boston victory. From April to October of 2017, Desi Linden took a break from running. She vacationed in Michigan with her husband, spent time doing other activities like kayaking, and didn’t resume training until she felt ready for it. Shalane famously took a long break before her New York City Marathon win, when she was derailed by a stress fracture and (according to interviews) did not go too crazy with cross-training. Correlation does not mean causation, but there’s something to be said about the mental and physical benefits of a brief running hiatus. What was your favorite moment of the Boston Marathon? There are so many great stories from this race! It sounds like there is definitely something to be said for taking a break before hard training. I can definitely see how it would be good mentally and physically, especially for elites whose training is so intense. I shared my favs from the week too because there are so many! It’s definitely a race that will be talked about for years to come. And now London will have record setting heat. You never know what can happen on race day! As someone who is also coming out of an 18-month running slump, I find Desi’s comeback so inspirational. I read an article on Shalane’s NYCM win when she was asked about hitting the peak of her career at the “old” age of 36, and she said she felt like she was finally in a place where her 20 years worth of work and consistency was starting to culminate. I think both hers and Desi’s wins are timely and important lessons about delayed gratification, in a culture where people have become so obsessed with instant gratification and feel like they need to achieve their biggest goals ASAP. Hard work matters but it’s just as important to pace yourself and enjoy the journey, and keep getting back up after you get knocked down.